Chalkos, the stone beach almost invisible from the high mountain road, is Sophie’s favorite. Its only bar, comfortably tucked under the palm trees, was still closed when we got there. As most island beaches, this one is for the locals. And they do enjoy it, coming with carry on fridges filled with watermelon, wine and oh-so-good Greek ice coffee. Kapsali is the touristic beach of the island, with people being brought to it by buses (even though the bus driver keep the beach location their most precious secret and refused to reveal it to us on multiple occasions). In fact, there are two beaches, on the two sides of the same bay (one side even has several – and I really mean, few – sunbeds). Kapsali also has many cafés and bars, – you will be happy you stopped by. 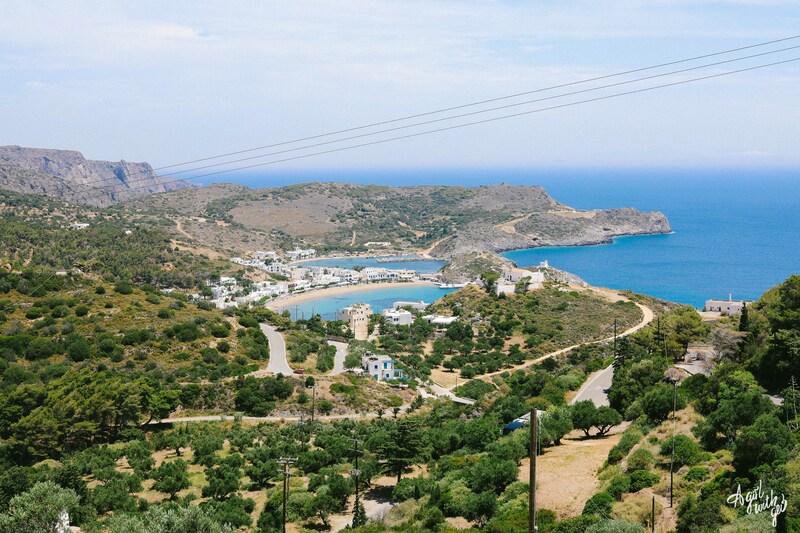 Now, Firi Ammos beach (there are two of them at Kythira, I am talking about the one in the north) is my favorite. Not only is has a gorgeous mountain view, super comfortable leather sunbeds are certainly a gigantic plus. Funny story with those sunbeds: we were at Kythira the first weekend of June. The beach was not officially open yet, the guys (who, I guess, are also the owners) were just setting it up. So they let us use the sunbeds for free, brought us water and refused the money Sofia offered them (she still left the money, Greek mentality vs Greek mentality). I was thinking about 150 EUR for 2 beds/ day at Portofino (and how surprised Sofia was then) and my heart sank with sorrow that I hadn’t discovered this place before. No wonder it’s on the top of my list. An extension of Firi Ammos, Kaki Lagada, is only reachable by foot (or by a solid 4×4 which we did not happen to have). A somewhat 15 min walk brings you to an absolutely deserted beach with a sudden lake at your back. Kaladi beach is for the brave at heart – and also for the young ones. It takes 150 stairs to go down to it – “But you are young!” as the legendary (at this stage) hotel lady told us. So we did: one last dip before chasing the sunset. There are also numerous hidden beaches, absent from the maps and known only to the very locals. One such beach we found at the bottom of then church Panagia Orfani when chasing sunset. At this point, we walked some good 30 mins from the church itself to catch the sun melting into the water. Coming towards us, there was a couple with an obviously upset lady on wedge shoes. From what I understood from the agitated and gesture-rich discussion, the beach was another 1h walk or so. The couple did not know for sure, eventually they gave up and turned back. Now you know all you need to know about Kythira beaches. Would you jump into the adventure and go? I certainly plan on coming back. Amazing! I would go there right now …. to be lost among their placid beaches and azure water! What is about resto? You didn’t tell much about local cuisine. 😛 wait for the final post on Kythira, hopefully sooner than in 3 months time 😁 and you go to INSEAD first!